His parents Ludwika and Seweryn Malewicz were ethnic Poles who had fled to Ukraine in the aftermath of the January Uprising of 1863 and he was baptised in the Roman Catholic Church. 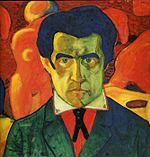 Malevich responded that art can advance and develop for art's sake alone saying that "art does not need us and it never did". He was a pioneer of geometric abstract art and the originator of the avant-garde Suprematist movement.